You can learn hand sewing and machine sewing techniques and sew your own clothes. Sewing machines are provided or you can bring your own. Classes include your own pattern and tea time! Students need to purchase their own fabric and notions. Hand sewing classes are fun for ages 7 through adult. Machine sewing classes are fun for ages 10 through adult. 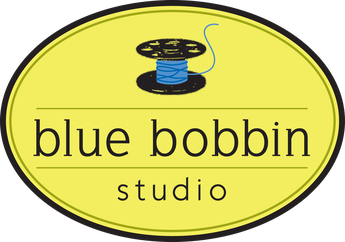 blue bobbin has a lovely selection of patterns, fabrics and notions! Sew this cozy sweater with a shawl collar or make a hoodie. Learn how to sew with knits, set in sleeves and attach a collar or hood. Suitable for beginners and up. Sew the Helmi Tunic, from Named Clothing. Helmi has a concealed button closure, rounded shirt collar, vents at the sides and a curved dolphin hem. Learn how to set sleeves, make buttonholes and sew on a collar. The pattern is sized for bust sizes 30"-45.75". This class is for advanced beginners. Private lessons are available for $20/hour. You can bring your own machine or use one at the studio. Call or email me to register or ask questions. There's a link at the top of the page for a list of materials needed.